Taking your furry four-legged friend camping means more than tossing an extra blanket in the car. Take our word for it, we’ve learned from experience. Here at the 50 Campfires base camp, our dogs get more excited about camping than we do, and who can blame them? Taking your pup along on an outdoor adventure provides a whole new world of sounds, smells and sights to explore! But it’s our responsibility to make sure that, along with having a great time while camping, our dogs stay safe, fed and healthy. 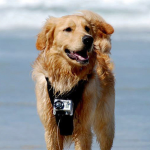 Over the years, we’ve found that having the right gear makes this much easier; so we’ve compiled our favorite gear covering everything from first aid kits to tracking systems, so that you’ve got everything you need to make sure that your pup enjoys camping as much as you do. 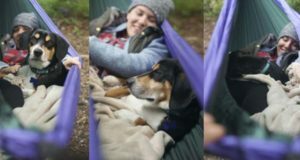 Be prepared next time you head out into the wilderness with our list of some of the best camping gear for dogs! Having access to drinking water is one of the most important priorities when you take your dog camping, and anyone who’s tried to give their dog water from a water bottle can tell you how valuable a collapsable bowl is while out in the wilderness. Many collapsible bowls on the market can also do double duty, working for food as well as water, and the variety of materials available today mean that you can find options that pack down so small you could fit one in your pocket. A packable, lightweight food and water bowl made from durable, long-lasting polyester fabric with a waterproof liner to help you combine storing, feeding and watering. 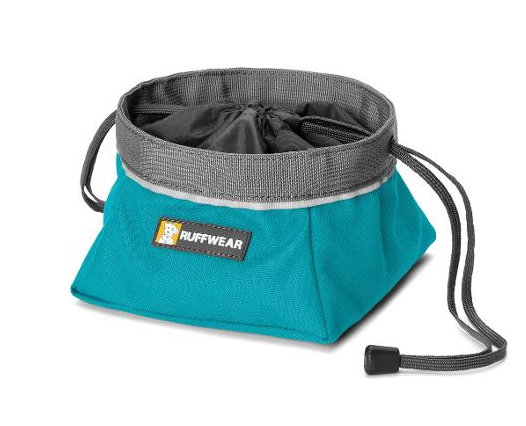 Features drawstring closure to keep food contained. Available in two sizes. 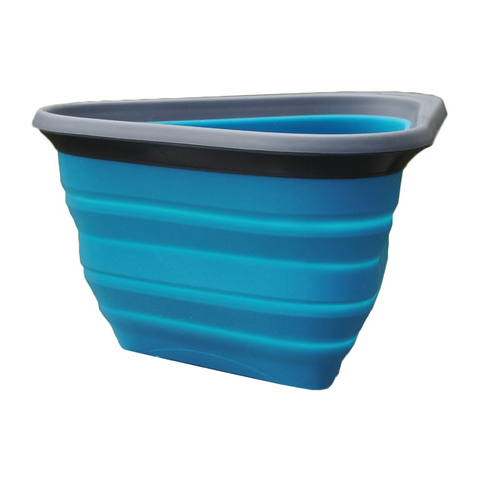 More information on the Quencher Cinch-Top Collapsible Dog Bowl is available here. A compact, dishwasher safe collapsible dog bowl made from food-grade silicone that pops open to use and collapses when you’re ready to stash in your pack. Holds 24 fluid ounces. 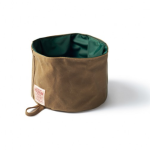 More information on the Mash & Stash Collapsible Dog Bowl is available here. 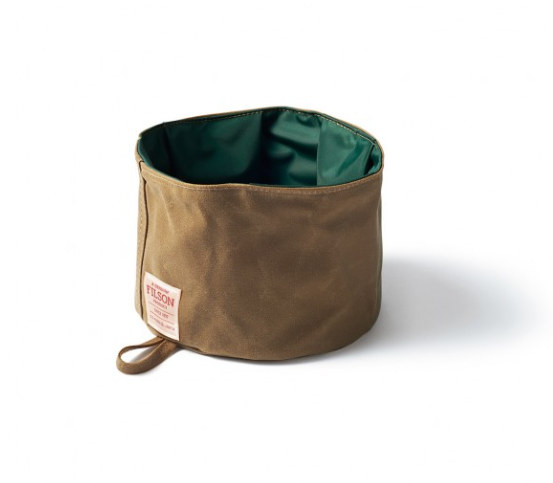 Made from a water-repellent Tin Cloth or Ten Mile Cloth exterior, with a water-resistant nylon interior lining. Easily collapses and stores in a pocket or clips onto a pack with the attached hanging loop. Choose oil finish Tin Cloth or acrylic Blaze Orange: both have a nylon lining and hold water, food and treats for your pup. More information on the Tin Cloth Dog Bowl is available here. Dogs love to help, and letting your furry friend share the load of food and water on the trail can be a literal load off of your shoulders. However, there are a few things to remember when you’re looking at a hiking pack for your dog. Most importantly, you want to find a pack with a good fit. A poorly fitting hiking pack can wear, blister and bruise your pooch, and dogs aren’t able to let you know what’s up when something goes wrong. Be sure to try different models and sizes of hiking packs with your dog, checking for fit and movement frequently as you start using your new equipment. Too much shifting and your dog may be in trouble. When loading your dog’s hiking pack, remember that dogs should carry no more than 25% of their body weight, and follow the same rules as you use when loading your own and keep heavy items near the bottom of the pack. 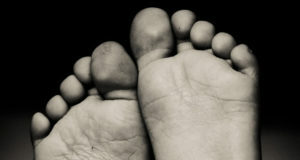 This will help maintain a low center of gravity and make movement easier to handle. If your dog is new to wearing a pack, start with a light load and work up until your dog knows what to expect. 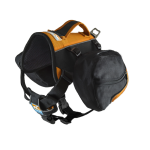 Adjustable 4-point chest harness, two zippered pannier pockets, single haul handle, metal D-ring attachment point for leash, air mesh panels for ventilation and reflective trim. More information on the K9 Dog Pack is available here. 8 adjustment points, rear-mounted leash hook, ergonomic padded spine support, two saddlebags, a large handle and reflective trim. 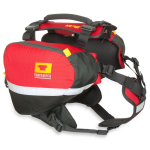 More information on the Baxter Pack is available here. 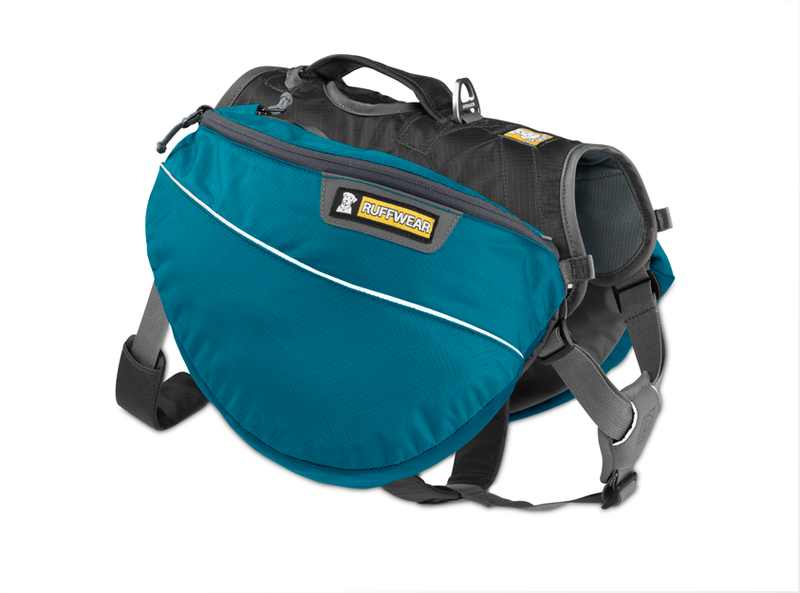 Attached saddlebags with a weight-forward design, Web Master™ Harness frame, padded handle, stash pockets and gear loops, a single-piece leash attachment point and reflective trim. More information on the Approach Pack is available here. Just like when driving a car, lights are not only so your dog can see, but also so that others can see your dog. 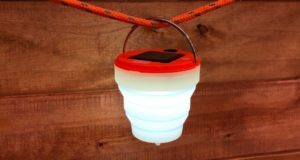 Especially if you let your dog roam around camp without a tether, lights like the ones we’ve listed below can help you keep tabs on your furry pal, or even prevent you from tripping over him when sitting around the campfire after dark. 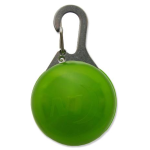 A water-resistant LED tag, with steady glow and continuous flash modes. 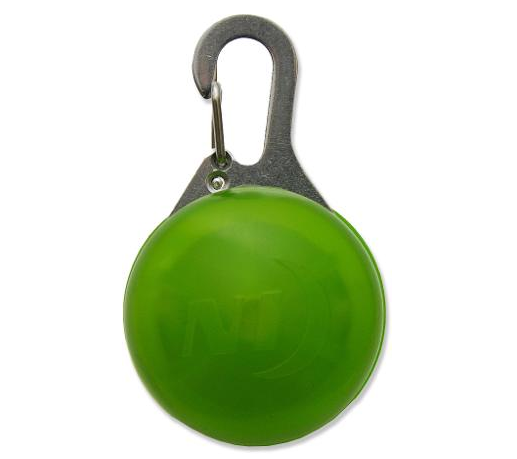 Set in a lightweight stainless steel carabiner, attaches quickly and securely to your dog’s harness or collar. Features a long-lasting LED that provides an ambient glow to alert other people of its location. Provides 20 hours of light on steady glow mode. 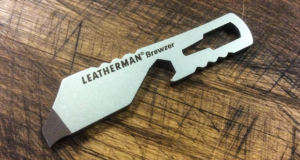 Custom engraving is available. More information on the Nite Ize Spotlit LED Carabiner is available here. A full coverage coat made from durable Ripstop material and a fleece lining, this coat features a flashing LED strip and reflective piping for high visibility. Waterproof and machine washable. More information on the North Country Dog Coat with LED Light is available here. 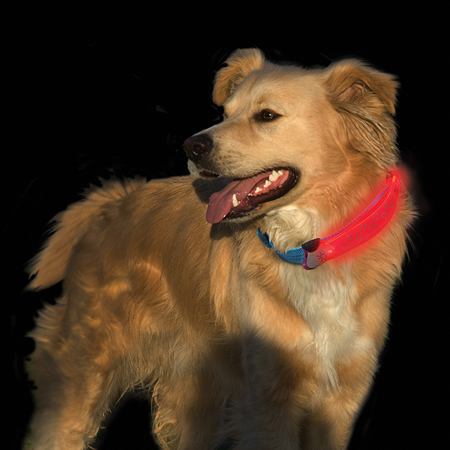 A low profile flexible LED strip that fits smoothly over your dog’s collar and secures with hook-and-loop tabs. 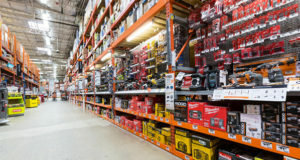 Red LED lights feature flash and steady glow modes, and provide 75 hours of illumination in steady glow mode. 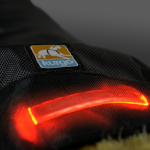 More information on the Nite Dawg LED Collar Cover is available here. Keeping your dog leashed is mandatory in many campgrounds and parks, and there’s a good reason why. With obstacles, unseen drop-offs and native wildlife, there are a lot of challenges out there that your pup might be excited to explore. Whether you want to take your dog along on a trail run or for a couple loops around the campground, leashes are a must for any camping adventure. 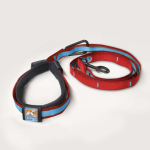 An award-winning, versatile dog leash that converts into 6 different styles: 6’ lead, 3’ lead, around the waist, tether, over the shoulder courier style, or double dog walker. Features a padded handle. Available in regular nylon and reflective nylon. More information on the Quantum Leash is available here. A stretch webbing leash that can be hand-held or waist-worn. Talon Clip™ provides a strong and secure attachment, the handle is padded for comfort and a convenient accessory loop is included for pick up bags or small clip on items. 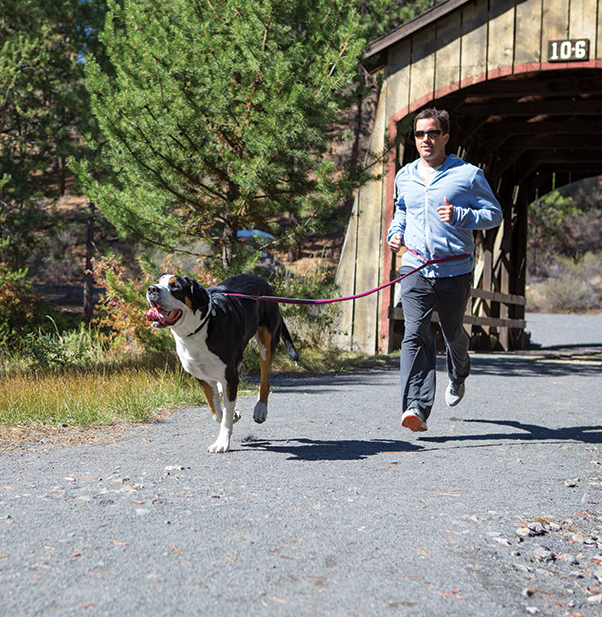 More information on the Roamer™ Leash is available here. 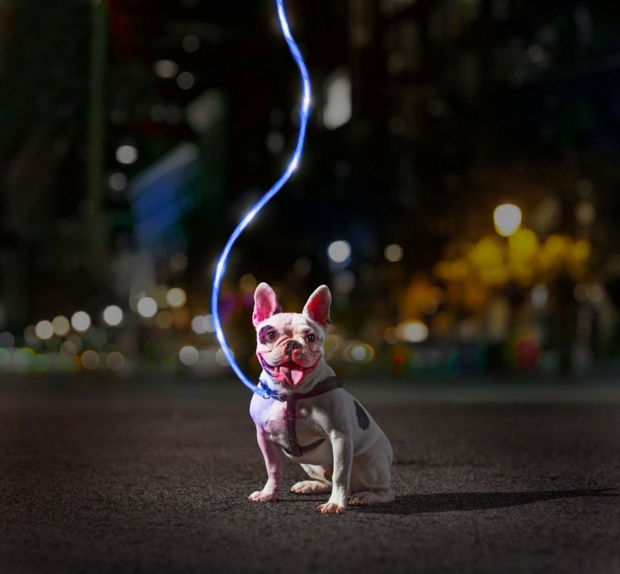 A 5′ illuminated leash, made of extra-durable reinforced nylon and featuring nine LED lights that run on three AAA batteries. 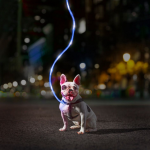 More information on the Litely Leash is available here. 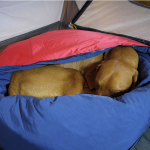 Dogs don’t like sleeping on a hard, cold tent floor any more than we do, and packing up your dog’s normal bed might not be the best idea for every camping trip. 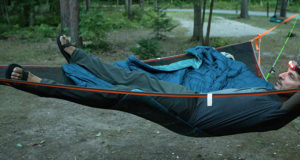 If you’re facing a weight limit or planning on encountering low temperatures on your camping trip, a specially designed sleeping back might be in order. 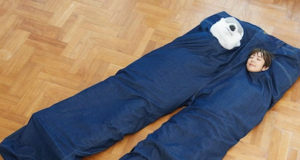 Dog sleeping bags are similar to those used by us, made out of similar materials, but sized for our canine companions. 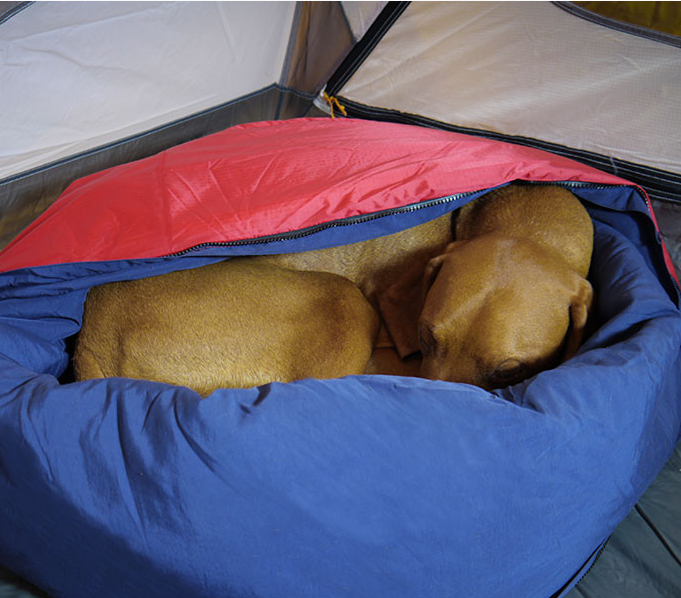 Having a dedicated bed while camping also gives your dog a sense of routine, which can be very helpful in making them secure while out in a new, exciting and sometimes startling environment. 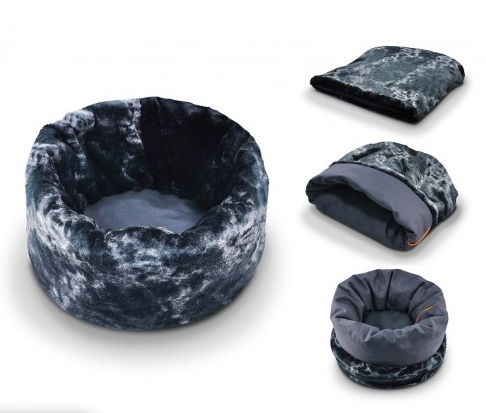 A compressible dog bed that transforms into a sleeping bag. 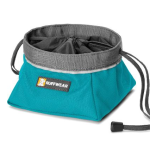 Compresses into its stuff sack for storage or travel. 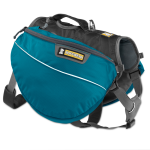 Features a Ripstop shell and cotton-like Taslan nylon liner. More information on the 2-in-1 NobleCamper™ is available here. Made from canvas on one side and faux fur on the other, and can be molded into a variety of shapes and uses. Machine washable, dryer friendly and made in a facility that meets the strict quality standards for infant and children’s products. 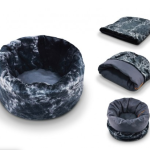 More information on the PLAY Lifestyle Snuggle Bed is available here. 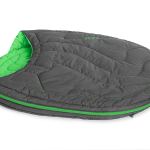 A packable, durable sleeping bag with a zippered opening allows the bag to open wide, then zip closed to retain body heat. 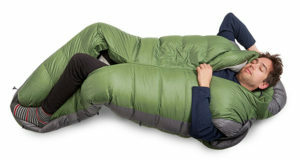 Features lightweight synthetic insulation and compresses into an included stuff sack. 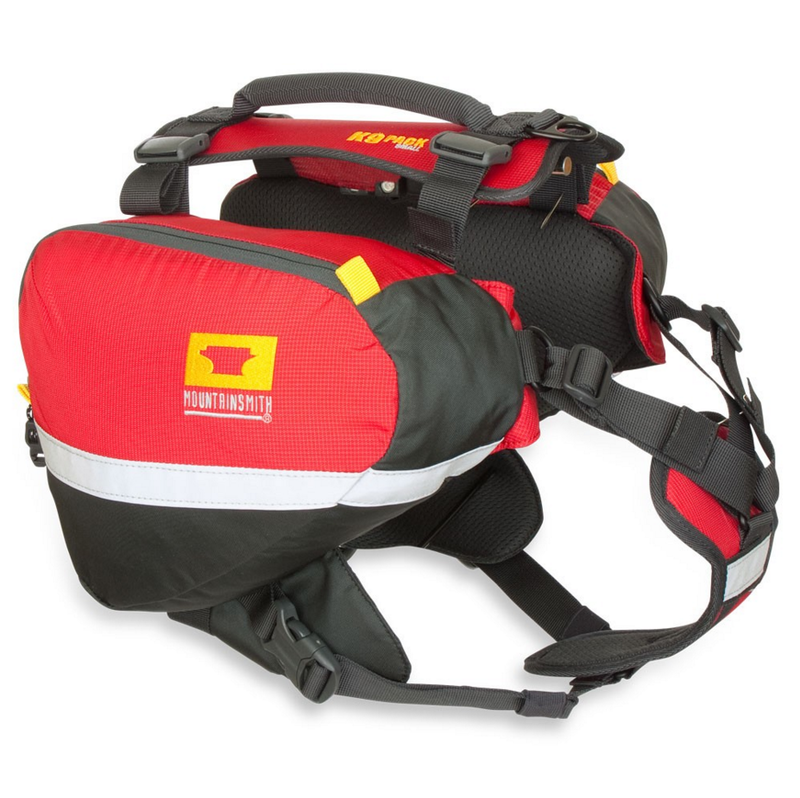 Integrated pad sleeve accommodates the Ruffwear Highlands Pad™ for additional insulation in extreme cold. Polyester fabric shell provides a comfortable sleeping surface and cleans easily. 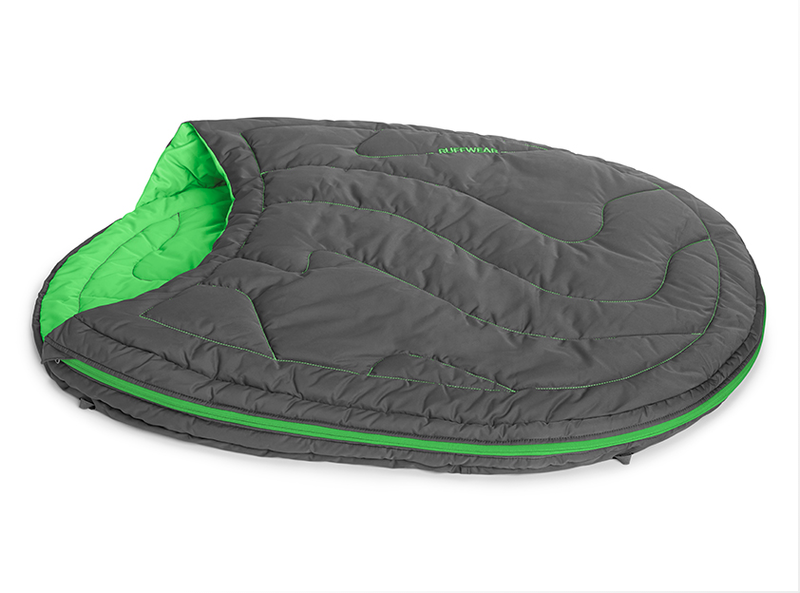 More information on the Highlands Sleeping Bag™ is available here. Your dog might love retrieving a ball tossed into the lake, but paddling around in a pond is a lot different than making a swim for shore in an emergency. If you plan on taking your dog out on the water in a boat, or if you own a breed that can’t handle water, your pooch could be in serious danger if something unexpected happens. When fitting your dog for a PFD (puppy flotation device, obviously), make sure that the buckles and straps fit tight around your pup’s body. 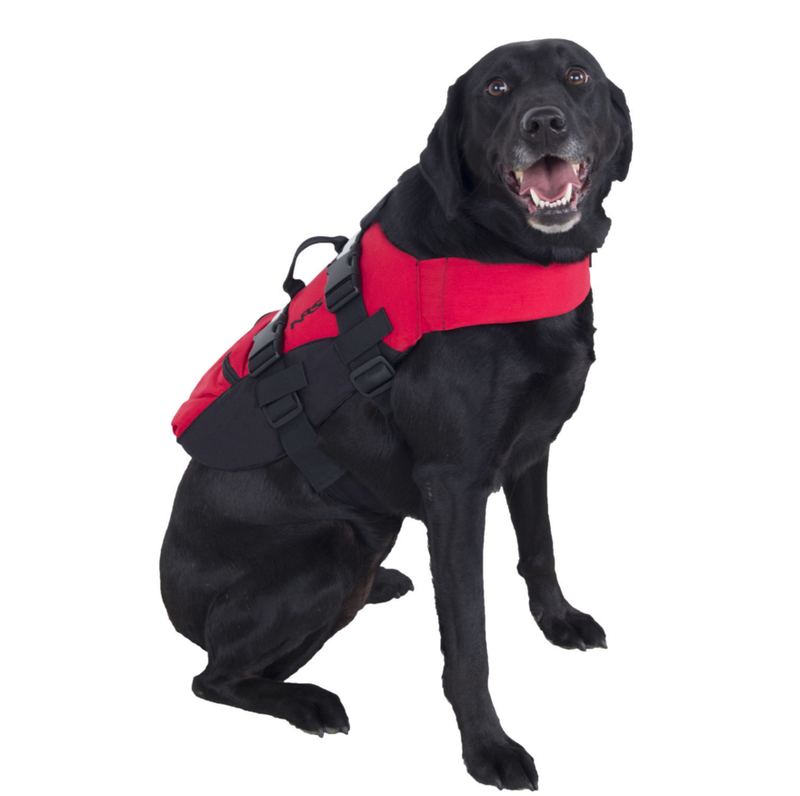 The life jacket shouldn’t restrict breathing at all, but your dog shouldn’t be able to squirm out of it. Once you’ve selected a model you think will work, be sure to test your dog’s life jacket in a controlled environment before hitting the waves. 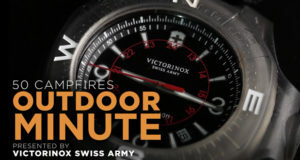 Made from 1680 Ballistic Nylon/Diamond Ripstop and available in five sizes. 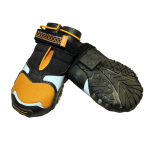 Uses 3 Layer Soft EVA 5MM Foam for comfort, and reflective trim for visibility. Features a low profile safety handle for lifting your dog out of the water. More information on the Aquapro Pet Flotation Device is available here. 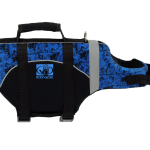 Made of a water resistant neoprene outer cover with form fitting foam filling for comfort. Mesh material in the underbelly and around neck provides breathability. Features high visibility reflective accents for added safety and a grab handle to help with guiding your dog in and out of the water. Available in 7 sizes. More information on the Body Glove Pet Flotation Device is available here. 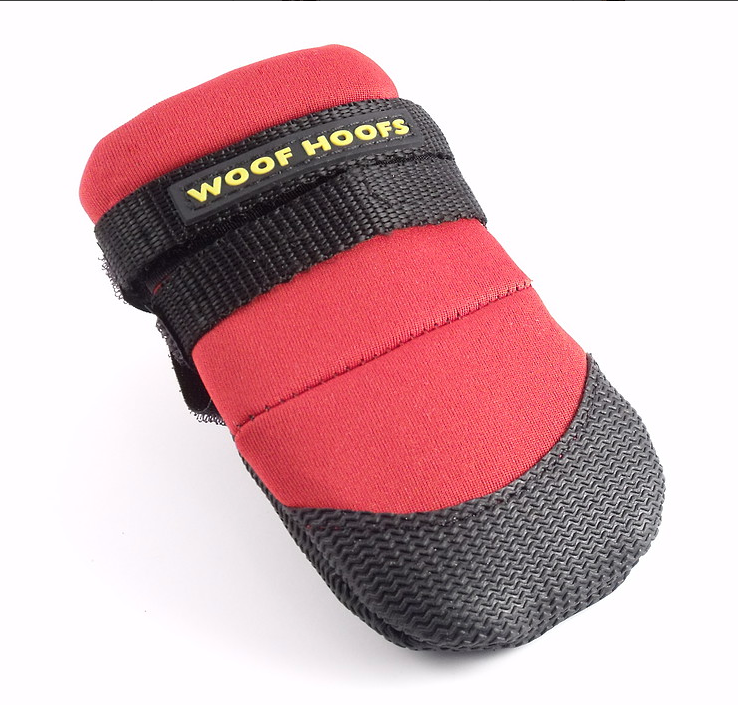 A 1000-denier Cordura® shell and simple design fit snugly without interfering with the dog’s normal activities. 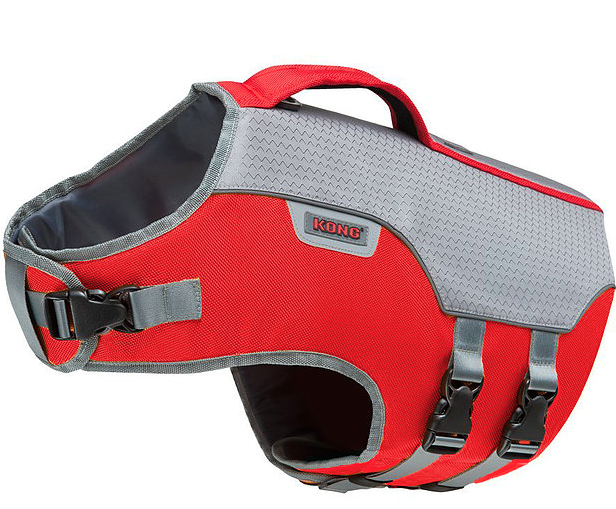 A grab handle on top of the vest works great for getting your pet back into the boat and for retrieving tired dogs, and a rugged leash ring allows you to use the vest as a walking harness or for attaching a strobe light. 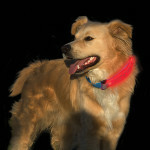 Reflective safety tape provides extra visibility, and a zippered pocket stows your leash or snacks. 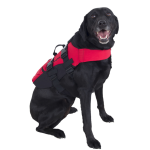 More information on the NRS CFD Dog Life Jacket is available here. 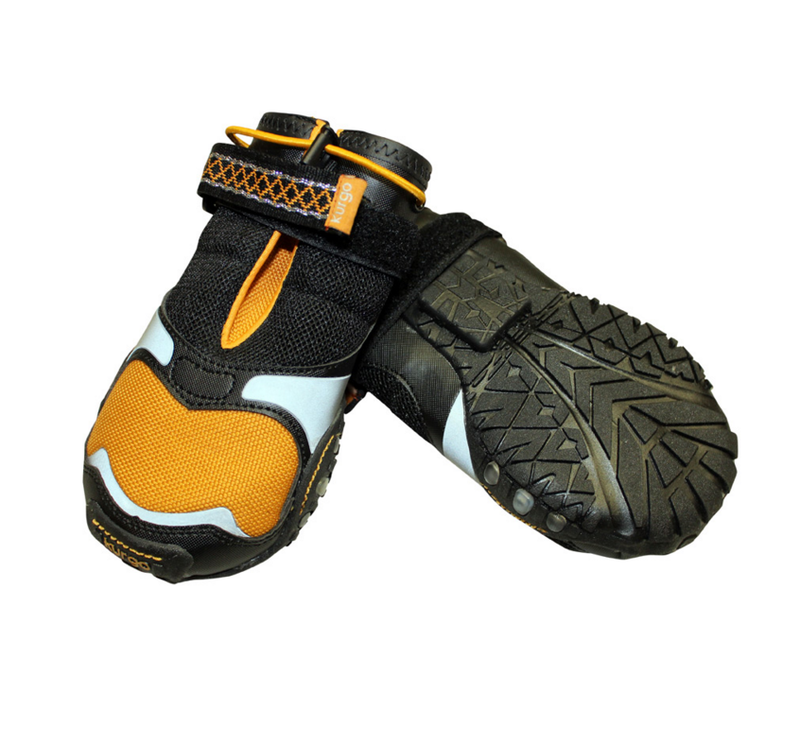 Especially when you’re in extremely cold or hot climates, boots can be great for dogs with sensitive paws. Ice and snow can easily pack in on the fur between a dog’s toes, and on some breeds the pads on a dog’s paws can be extremely sensitive to temperatures. Remember that your dog’s boots should be comfortable, not rubbing or wearing the pads on their paws, but also not easily coming off. If you’ve got the ability to introduce your dog to boots as a puppy, it may make acclimating easier, but you may also have good luck getting your dog used to boots before going camping. Lastly, remember that a dog’s front paws may be smaller than their rear ones, and if that difference is significant you may want to buy different sizes. Cold weather dog boots designed for warmth, paw protection and traction, featuring a Vibram® Icetrek® ice-specific sole compound. Three-layer laminated soft-shell upper is DWR coated and is weather-resistant, wind-resistant and breathable, and extended gaiter height gives added leg protection. More information on the Polar Trex™ is available here. 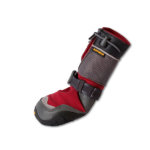 Woof Hoofs winter boots are made of stretchable, insulating neoprene material, while summer boots use a breathable, lightweight mesh upper. 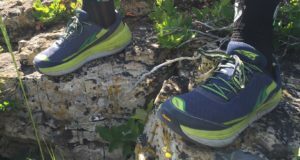 Both winter and summer models feature a durable, yet flexible rubber traction sole. 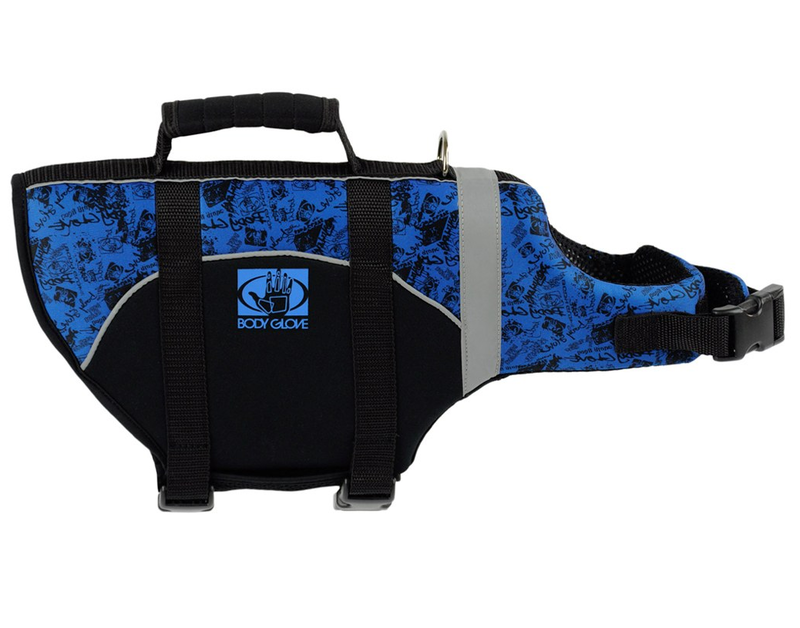 Dual strap design ensures a secure fit that minimizes the chances of slipping or falling off. More information on the Red Ranger is available here. Protect paws from cold in winter and heat while also providing support and protection. Made of breathable tight-weave mesh and synthetic leather uppers and outsoles to provide protection and durability. 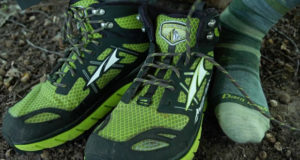 Features light-up soles and reflective welds for visibility in the dark, ankle cord lock for adjustability and long-lasting sealed battery for water resistant activity. 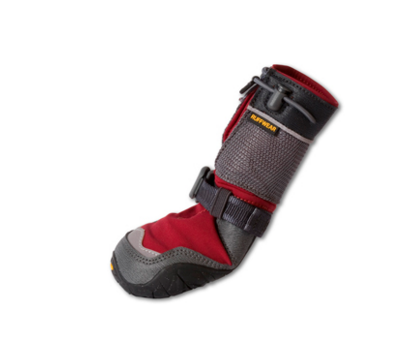 More information on Step ‘n Strobe Dog Boots is available here. If you’re heading off into the wilderness, a first aid kit is probably somewhere near the top of your packing list, but dogs have some unique health needs that you might want to consider. 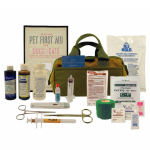 Many companies make special pre-packed kits, just for canine friends, that include items not commonly found in the usual first aid kit, like emergency dog food, tick removers and pill guns. 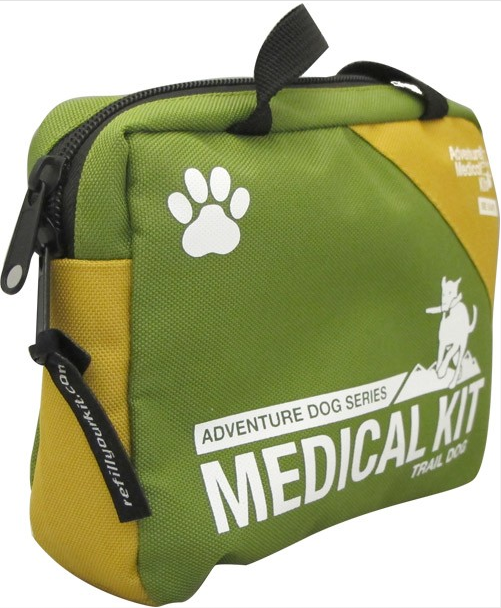 This kit caters to the types of injuries dogs encounter most on the trail – primarily to their paws, with an assortment of dressings, bandages, and tools like the splinter picker/tick removers to remove ticks or thorns. 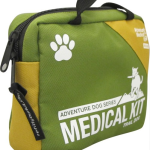 More information on the Trail Dog First Aid Kit is available here. This kit provides three days worth of emergency essentials, and along with food, water and toys, this kit includes antiseptic, gauze rolls, antibiotic and more. 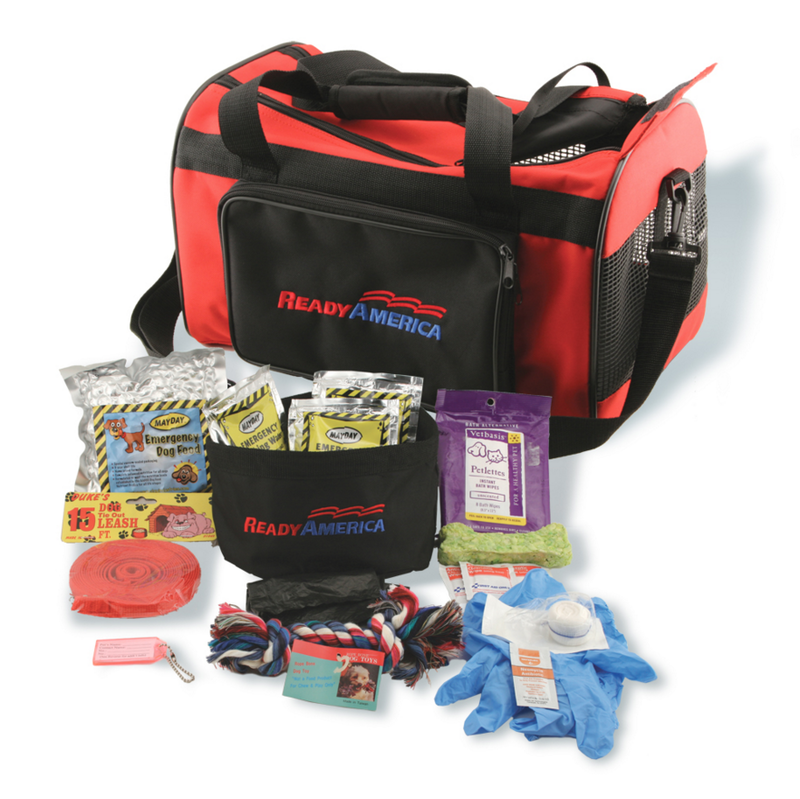 More information on the Small Dog Evacuation Kit is available here. 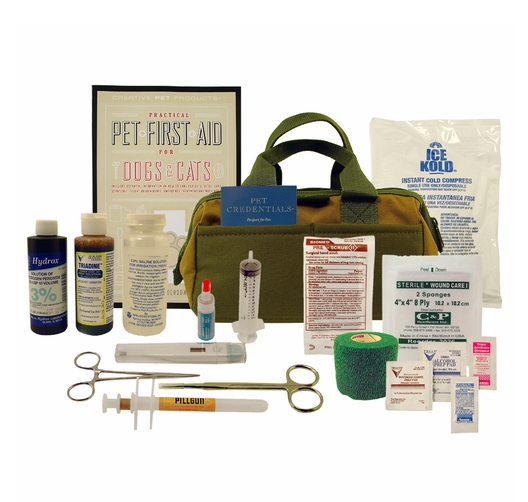 A kit that goes beyond the normal, everyday encounters a dog might have in the great outdoors, this kit also packs emergency stabilization items like a first aid book for dogs, skin staple gun, surgical scrub brush and syringe. In addition to the more extreme items, this kit includes the more basic items covered by more standard first aid kits, like hydrocortisone cream, antibiotic ointment, gauze pads and more. More information on the Sporting Dog First Aid Kit is available here. 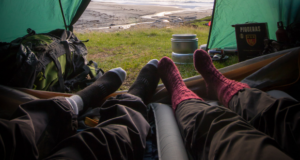 Gearing up your pooch for adventures in the great outdoors doesn’t have to be limited to the bear necessities; there are a number of accessories, training tools, toys and gadgets that can make camping more fun for you and your furry friend. The Tru-Fit Harness with camera mount plate allows you to mount an action camera (ie, GoPro®, Sony Action Cam) to your dog’s back or chest. Five-point adjustment system for a perfect fit and camera stability. Quick release buckles provide functionality as a walking harness or in-car pet restraint. 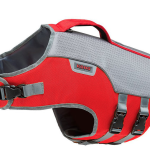 More information on the Tru-Fit Smart Harness is available here. 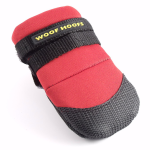 Allows you to keep track of up to 10 dogs with multiple handsets and T 5 or T 5 mini dog devices. 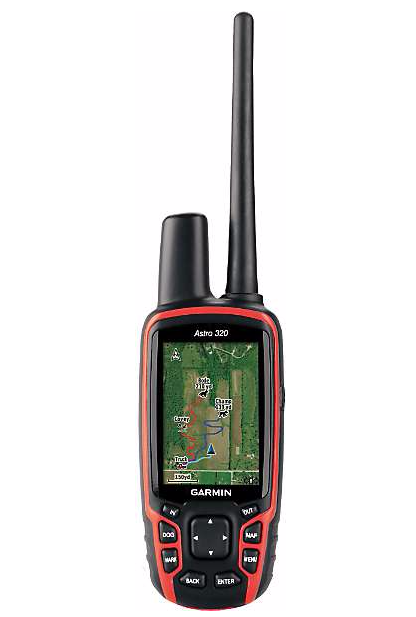 Features include a high-sensitivity Garmin GPS/GLONASS transmitter, map drawing capabilities, BirdsEye Satellite Imagery compatibility, a 3-axis electronic compass and a vibrant, sunlight-readable 2.6-inch color display. More information on the Garmin Astro 320 is available here. 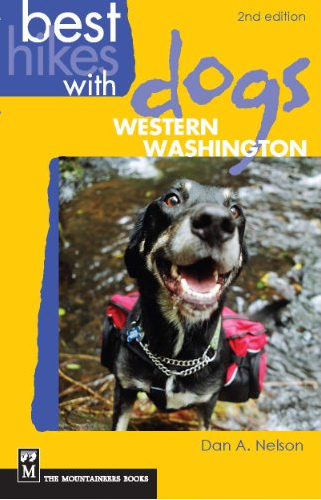 A great reference book for anyone bringing their dog along on an outdoor adventure, these books provide trails carefully selected for scenic value, low crowds and dog safety. Hikes range from short strolls to challenging long range journeys, with notes on difficulty level, best season to go, and scenic highlights. More information on the Best Hikes for Dogs book series is available here.